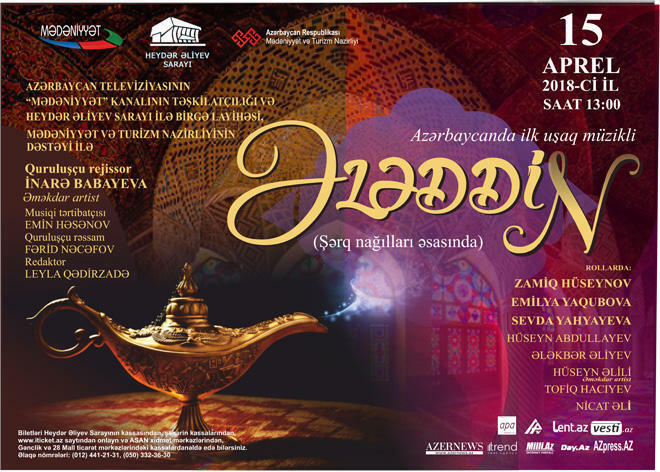 The first in Azerbaijan musical for children "Aladdin" will be premiered in Heydar Aliyev Palace on April 15. The director-producer of the musical is the Honored Artist of Azerbaijan Inara Babayeva. The cast includes Honored Artist Alakbar Aliyev, pop stars Zamig Huseynov, Sevda Yakhyaeva, Emilia Yagubova and other popular artists and singers, Trend Life reported. Oriental flavor, incendiary dances, sparkling humor, magical scenery, and most importantly, stunning music and songs performed by famous singers guarantee a lot of fun not only for kids but also for adults. Undoubtedly, the first in the history of Azerbaijan children's musical will be a real event in the cultural life of the country. The event is co-organized by Mədəniyyət TV and the Heydar Aliyev Palace with the assistance of the Ministry of Culture and Tourism. Tickets can be purchased at the ticket office of the Heydar Aliyev Palace, the ticket offices of the city, website www.iticket.az, ASAN Xidmət centers, cash offices of Gənclik Mall and Mall 28.